It’s part rock concert, part basketball championship, part NASCAR, and part Broadway. It’s more than robots. FIRST mentors change their students’ lives everyday. Professional engineers, teachers, mentors, volunteers, and parents team up with young adults and the resulting experience doesn’t just build robots – it builds confidence and self-respect. Students that participate in FIRST are 50 percent more likely to go to college and twice as likely to major in science and engineering. Get involved and help inspire our next generation of STEM leaders. To find a team in your area click on the map below. Interested in connecting with a team? Visit the Contact Us page! This is where it all starts. FIRST (For Inspiration and Recognition of Science and Technology) aspires to transform culture, making science, math, engineering, and technology as cool for kids as sports are today. Learn and play with the ‘pros’ of the science and engineering world. Apply math and science concepts to design, build, test and compete with robots. Gain hands-on experience solving real-world problems. Discover the excitement and rewards of science and technology careers. Every student — regardless of their scientific, mathematic or technological expertise — can participate in FIRST. For more information on joining or starting a team in your area, please contact us. IndianaFIRST is truly a volunteer-driven organization. 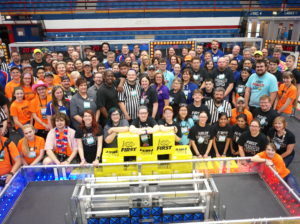 With over 300 teams state-wide, it takes a large and diverse group of volunteers to make IndianaFIRST successful: mentors and coaches guide the students on their teams, event volunteers make the seasonal events possible, and field volunteers continue to help IndianaFIRST grow season after season. Volunteers are community leaders, employees of small businesses and large corporations, teachers, parents, university students and faculty, FIRST alumni… and YOU! Make a difference in the lives of young people. STEM (science, technology, engineering, and math) activities. There are many regional and championship competitions, both official and off-season, that take place throughout the state. Every event requires 40 — 80 volunteers to make it a success. No expertise is required, just a passion to help our future leaders grow and succeed. For more information on volunteer opportunities, please contact us. As a mentor or coach of an IndianaFIRST team, you will work side by side with kids ages 6 to 18, providing experiential learning opportunities and showing students how math, science, and technology are used to solve problems in the real world. If you are interested in becoming a mentor, please contact us. For those specifically interested in mentoring an FRC team of high school students, you can visit our map below to see where all the FIRST Tech Challenge and FIRST Robotics Competition teams in Indiana are located in order to see if there is a team in your area that might fit your interests. We also recommend finding an event in your area. Attendance is free and you will be able to see a competition first-hand while meeting teams from your area. How can you support IndianaFIRST? FIRST events are exciting and fun-filled opportunities to see youth in action, applying the knowledge and skills developed through team participation. Each event includes not only students, but also a large audience of parents, university and corporate mentors, and local leaders in business, government, education, and the media. Local and regional events offer prominently visible opportunities to recognize the support and generosity of their sponsors. Contact us for more information on available events and sponsorship packages. Companies can sponsor teams by providing a number of supports including funding, mentorship time and talent, volunteers, equipment, and more. If you are interested in becoming a team sponsor, we recommend seeing what events are in your area. Attending these events with one or more of the decision makers from your company will give you the opportunity to talk to students and mentors and see the robots they build in action. We guarantee you will be impressed, amazed, and inspired to support IndianaFIRST and the youth we serve in our programs. If you can’t find an event in your area, or have any questions about sponsoring a team, please contact us. 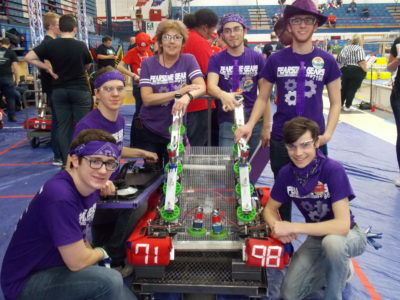 Your generous donation to IndianaFIRST will help ensure thousands of students have access to the unique experiences we offer through our programs. By making your unrestricted gift to the Annual Fund, you will allow IndianaFIRST the flexibility to allocate funds where they are most needed, including to regional events, teams, and operational expenses. If you are interested in donating to IndianaFIRST, please contact us. IndianaFIRST greatly appreciates the support of its sponsors, suppliers, and contributors. Please join our community of companies, colleges and universities, foundations, government agencies, professional associations, other nonprofits, and individuals working to inspire youth to pursue STEM excellence. Stay in touch with IndianaFIRST! 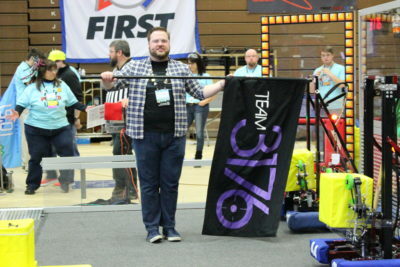 IndianaFIRST would like to invite FIRST Alumni from Indiana FTC or FRC teams and FIRST alumni who have transferred into the state to join our Alumni Mailing list. There will be at least four annual emails that go out in January, May, September, and November in addition to a confirmation email that you’re on the list. To join, please fill out this form. We are open to having an Alumni volunteer to coordinate local networking events for alumni to attend. IndianaFIRST would be happy to share details about the events via this email list, on social media, and in our team emails if the information is provided to Chris Osborne, IndianaFIRST Program Director.